Left to right, Premier of Nevis the Honourable Mark Brantley; Mary Anne Hamilton, great-great granddaughter-in-law of Alexander Hamilton; Kegel Isaac; Jonnicia Williams; Kirmani Hanley; Kimalijah Warner; and the Hon. Eric Evelyn, minister of Youth and Community Development are pictured at the Alexander Hamilton Scholarship Award Ceremony Jan. 12 on the Alexander Hamilton Museum grounds. CHARLESTOWN, Nevis – Four students are now the new recipients of the Alexander Hamilton Scholarship Award. 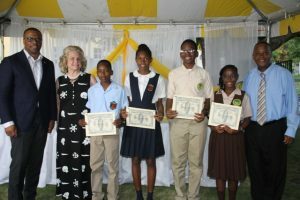 The students were presented with their awards by the Honourable Eric Evelyn, minister of Youth and Community Development on Nevis, on Jan. 12 on the Alexander Hamilton Museum Grounds during the annual staging of the Alexander Hamilton Tea Party in commemoration of his indelible historical presence. The scholarship, an initiative that began more than 50 years ago, is awarded to four first form students to assist them in their academic endeavours throughout secondary school. Kegel Isaac and Jonnicia Williams are the recipients from the Charlestown Secondary School, while Kirmani Hanley and Kimalijah Warner are the recipients from the Gingerland Secondary School. In brief remarks, Evelyn admonished the recipients to continue to attain the highest grades and vowed to show an interest in their performance during the years of their tenure in secondary school. Community Development Officer Tracey Parris gave an overview of the scholarship fund for 2017. She stated that in July 2017, three of the eldest recipients exited the programme, as they were finished with secondary schooling, and congratulated them on the passes attained at the CXC levels. She also encouraged the newcomers to work hard as she highlighted the guidelines regarding their upkeep of the scholarship. She further encouraged them to learn as much as they can about the life and times of Alexander Hamilton. The recipients are required to contribute some hours of community service at the Hamilton Museum of the Nevis Historical and Conservation Society, maintain academic eligibility, and submit report forms and other documentation required for the scholarship programme. The event was also attended by Premier Mark Brantley, Mary Anne Hamilton, widowed great-great granddaughter-in-law of Alexander Hamilton, the Trott Family, past scholarship recipients and members of the general public.